Lima, Peru, June 2017: The initiative to include new standards, which was presented in August of last year, was approved and included in version 16.5, in which the processes of Number Portability were defined so as to allow the operators needing to provide this service to have the best practices and standards, and thus reduce costs, risks and time to market. This initiative was born out of constant research and participation in the various forums of the TM Forum, as well as from our attentiveness to the needs of our customers, in which it was observed that there were no Number Portability standards available for use and resulting in the approval by the TM Forum of the presented initiative. The working group led by BYTE included the participation of TM Forum consultants and experts, as well as European operators such as Orange and Vodafone, who together shared their knowledge for the purpose of defining the processes for Number Portability. 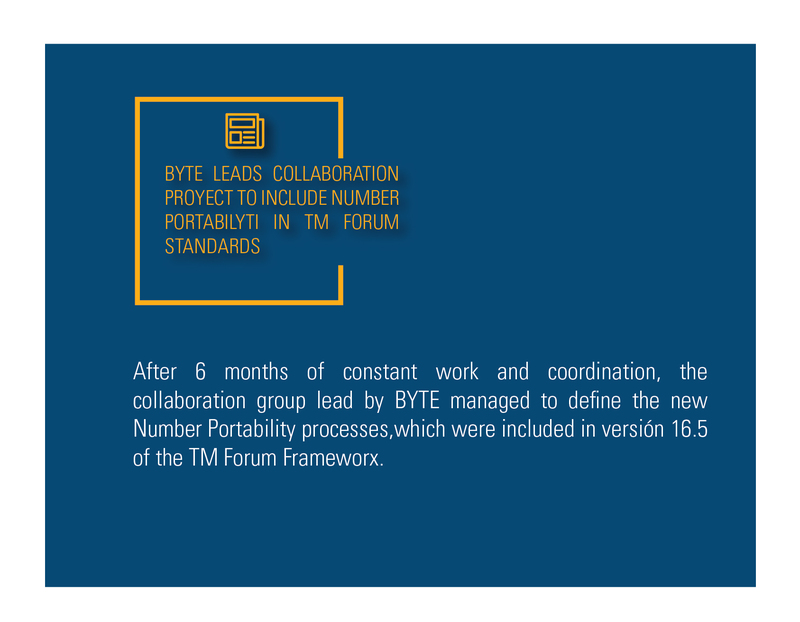 The constant feedback from the collaboration team allowed BYTE to improve the definition of the Number Portability processes and thus transfer this knowledge to our solution PortaByte implemented at our clients with satisfactory results. TM Forum is an association of over 850 member companies generating US$2 trillion in revenue and serving five billion customers across 180 countries. The Forum drives collaboration and collective problem-solving to maximize the business success of communication and digital service providers and their ecosystem of suppliers around the world. Today, the Forum is focused on supporting members as they navigate their unique digital transformation journeys, providing practical and proven assets and tools to accelerate execution and platforms to facilitate collaborative problem solving and innovation. Learn more at www.tmforum.org.